Jeannie Kure Robertson Bagley, granddaughter of Hans Kure Sr. and daughter of Hans Jr., was born in 1917. They lived in Wilmington during the school year. As soon as school was out in June, Jennie and her four older sisters moved with the family to the beach cottage on Atlantic Avenue and stayed till Labor Day. In the 1920s Jennie walked out of the family summer home, down the bank, jumped on the beach, ran out about 50 feet, and went swimming. Before the war, the men wore jersey bathing suits. Jennie didn’t wear wool stockings, like most women, but always had a bathing cap. 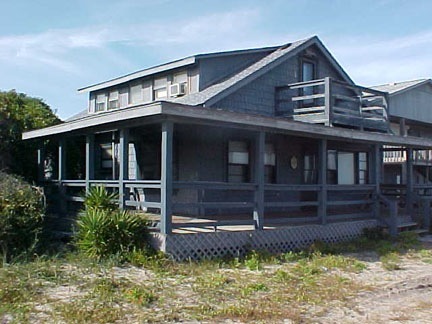 The Kure Cottage had two floors; a bathroom on each floor, and a big porch with a swing, but no phone. Jennie’s mother made bread and pies every Friday – baking day – in a three burner oil stove. Trash was burned in the woods. Jennie’s father drove to Wilmington everyday in his Model T Ford to work at the Atlantic Coastline. When Jennie’s father died, her mother married Lawrence Kure. LC Kure got the Tidewater Power Company to put in some poles for electricity. He’d make Jennie think she was starting the lights just as it got dark. When they were turned off at 10:00, you sat in the dark if you didn’t have a lantern.